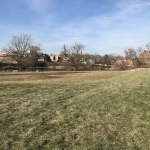 The Ottawa High School Fox River levee project will begin as soon as possible now that the school board has chosen D Construction of Coal City to be the contractor. The company put in the low bid, just under $1.3 million, to heighten the levee to 477.5 feet above sea level. Supt. Mike Cushing says it won’t have a big impact on the public. Nearby home owners have been contacted about it. The project must be done by August 30 to get a $1.2 million Federal Emergency Management Agency grant for it. Heightening the levee means the school district won’t have to arrange for emergency sandbagging every time the water gets very high.